What warm blooded creature doesn’t love scrambled eggs with bacon for breakfast or even better…a stack of banana pancakes for lunch? Especially when that breakfast comes with a side of DELICIOUS Belizean favorites like fry jacks or thick homemade flour tortillas? Or more American style diner favorites like hash browns and the bottomless cup of coffee? Well, I found a place in San Ignacio in the Cayo District that is serving breakfast all day long in a place that almost feels like a New Jersey (home of the world’s classic) diner. Pop’s Restaurant. And inside, Pop’s even has the vinyl upholstered booths of a classic diner – just six of them – so be prepared to wait on a busy morning. The place has a bit of a hole-in-the-wall feeling…but clean and homey. And the food is GOOD. It’s the yummy, simple cooking that is exactly what you want after a late night of partying or just on a rainy afternoon. Who knew that I’d find the best fry jacks ever here? The lightest fluffiest most delicious. And 3 for $3bzd? You’ve got to order a side of these. And for those of you who don’t know what a fry jack is…well…shame! 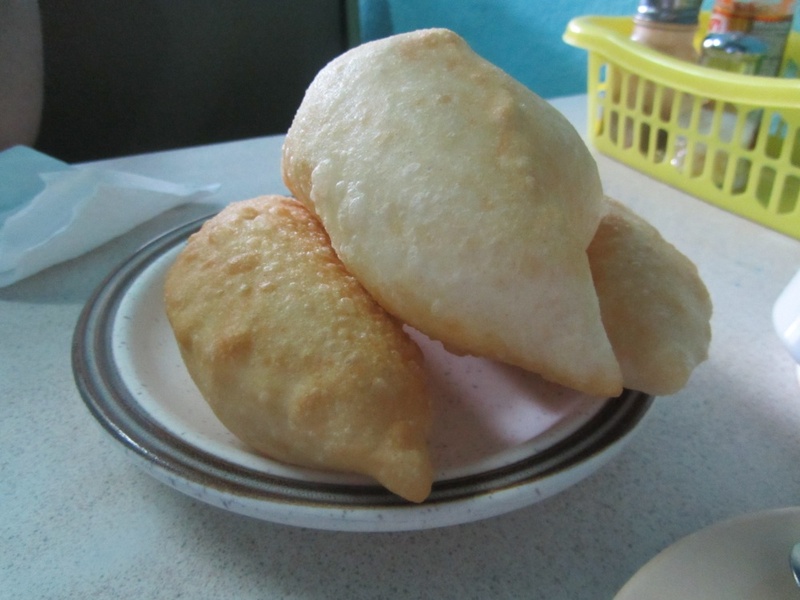 A fry jack is the dough of a flour tortilla (just flour, baking powder and shortening) deep fried. It can be eaten with jam, fruit or honey…sweet. Or savoury, with eggs or beans or just about anything. You want to eat them warm and you want to eat them often. For the best fry jacks in San Pedro: Try Estel’s By the Sea. 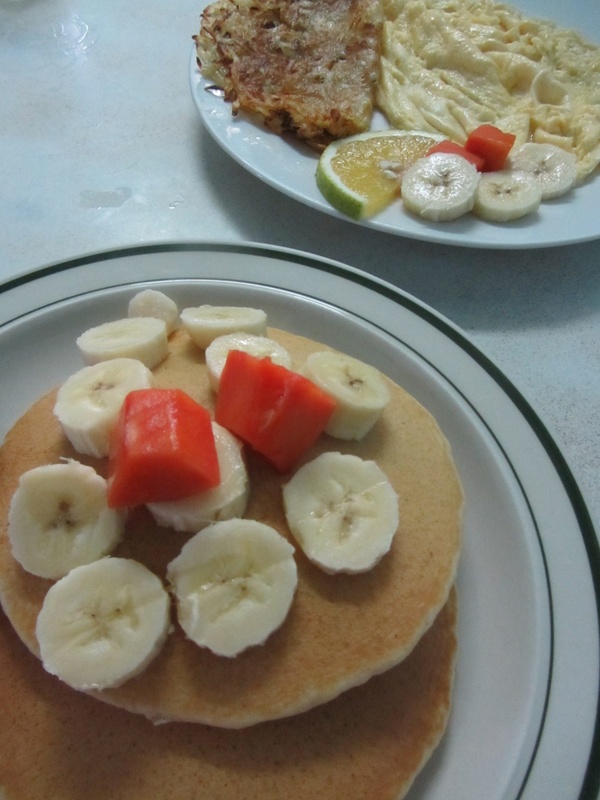 The banana pancakes I ordered at Pop’s were delicious too. Open every day from 6:30am to 3pm-ish. 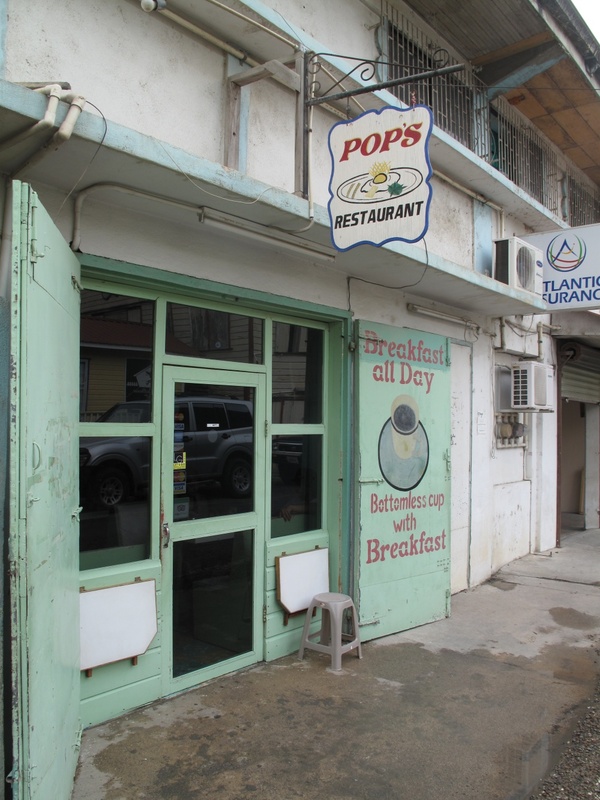 Pops is located on West Street parallel to Burn Ave (the main street). It’s behind the big Courts Building. Just ask…you’ll find it easily. I’ve got to give Pop’s the San Pedro Scoop sunglasses of Excellence. I can only imagine the partying that will go on in San Ignacio tonight! And, I am ALWAYS willing to change my opinion…maybe I haven’t tried the best breakfast in your town. Let me know where it is in the comments. I love to eat.